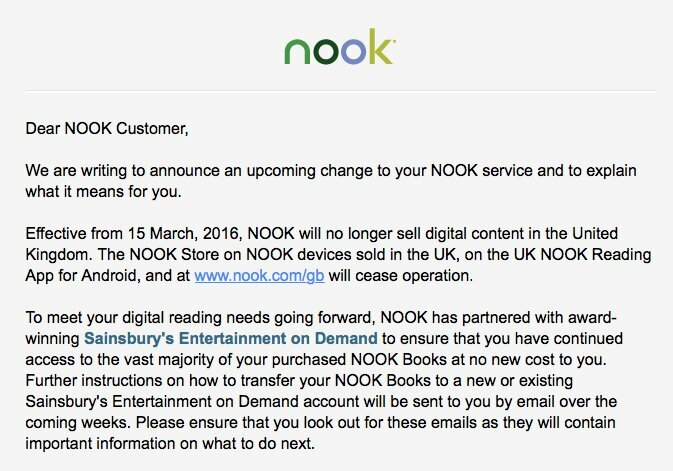 Nook is dead in the UK, and customers who bought books thinking they might actually own them are now being told they might be able to still access some of them once the Nook store implodes, due to a partnership with “award-winning Sainsbury’s Entertainment on Demand”. First, which awards? The Sainsbury’s On-Demand Digital Entertainment Brands Run by Sainsbury’s Awards? I was only vaguely aware Sainsbury’s did this sort of thing at all, let alone had won awards for it. Secondly, this again goes to show that when you’re buying an awful lot of digital content, you should consider doing so nothing more than a temporary rental, even if (and this is the bad bit) you’re not flinging money at streaming. That is, frankly, not good enough. Thirdly, this again showcases how DRM merrily punches in the face consumers who try to do the right thing. If you spent money on Nook books, chances are you’ll lose at least some of them now. Had you torrented those books, you’d still have copies. And in the UK, you can’t just legally strip the DRM and make your own copies; it’s illegal to breach DRM, with only (minor) exceptions being made for people with disabilities who have no other way to access the content in question. You should not get a worse user experience on paying for something, but that’s increasingly the case. Music, at least, has been freed up somewhat, with purchases now typically being DRM-free across the industry. Some comics companies (such as 2000 AD) make a point of being DRM-free across platforms. But this is still rare. More often than not, any digital movie, TV show, comic or book you buy is wrapped in DRM, blocking portability and permanence. Purchasing digital shouldn’t be a glorified extended rental. It’s no wonder many people now opt out of paying for media at all. I love the wording. “At no new cost to you.” Gee, thanks!